The classical Greek Philosopher, Socrates (470 - 399 BC) was credited to have said that the goal of philosophy was to “know thyself”. The imposing life-sized bronze sculpture Auguste Rodin’s ‘The thinker’ in Paris, France shows a male figure sitting on a rock with his chin resting on one hand as in deep thought & is often used as an image to represent philosophy. Cogito, ergo sum “I think, therefore I am.” is a Latin philosophical proposition by the 16th Century French Philosopher, René Descartes which became a fundamental element of Western Philosophy, forming a secure foundation of knowledge in the face of radical doubt. Descartes asserted that the very act of doubting one’s own existence served as a proof of reality of one’s own mind. There must be a thinking entity “self” for there to be actual thought. Rideo, ergo sum “I ride, therefore I am” is a 21st Century Warrs Harley-Davidson Philosophical proposition that asserts that the very act of riding a motorcycle serves to assert one’s own mind & a physical projection of one’s ultimate existence. There must be a thinking entity “self” for there to be actual motorcycle riding. “I ride, therefore I am.” - C&F H.O.G., the thinking persons’ motorcycle club. Route: Meet at 611 KR for 09:00 for a ride briefing at 09:45 sharp. We will depart at 10:00 & travel westwards to the edge of Virginia Water & Windsor Great Park for a brief coffee stop then travel North Westward into the Chiltern Hills area of outstanding natural beauty (AONB) we follow the views Westwards & then head South West to the North Wessex Downs AONB. Coffee Stop: Manager Olivier will welcome us at the Belvedere Arms, Sunninghill located on the edge of Virginia Water & Windsor Great Park for Tea/ Coffee. Petrol Stop: Those wishing to will be able to brim their collective tanks at the local petrol station (on route to our destination) (mileage: est. 66 miles from 611KR). 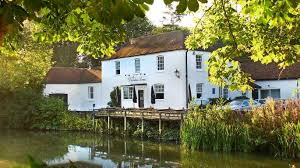 Final Destination: We will be welcomed by Manager Lee & the Team at our final destination at the Dundas Arms which is perched perfectly between the River Kennet & the Kennet/ Avon Canal in the charming town of Kintbury, West Berkshire. This upscale 18th century Grade II listed inn is an idyllic place to enjoy a choice bite to eat by the river. Inside this riverside Regency gem, you’ll find distinctive nooks & crannies complete with an antique penny bar, large fireplaces & a handsomely decorated two-storey dining room. Pre-Order Your Sunday Lunch Food: This is a very popular Sunday Lunch destination. Therefore, is very important that if you want to eat lunch you will have to choose and pre-order your food Menu with myself (jonathan ‘dot’ gooch ‘at’ hotmail ‘dot’ com). All orders must be placed by end March 2019. There are limited spaces available, like all good things, please book early to avoid disappointment. This will help the Dundas to be able to smoothly accommodate us. Priority will be given to those that have pre-ordered. Also, please note, there are alternative Sunday Lunch venues in nearby Newbury should you wish to venture further afield. Return: Our Final destination is approximately 63 miles back to London conveniently located near Junction 13 of the M4 (for those wanting a more direct route).